After a restful sleep in Wharton Condominium; me, My Beloved Wife Lei, and the kids have the energy to finally begin our tour around Baguio City. 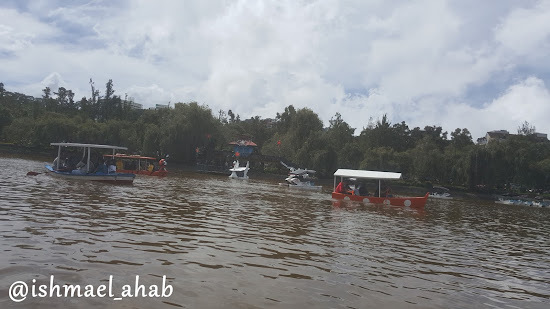 Our first target for that day was the tourist spot considered as the “Mother of All Parks” in Baguio City. 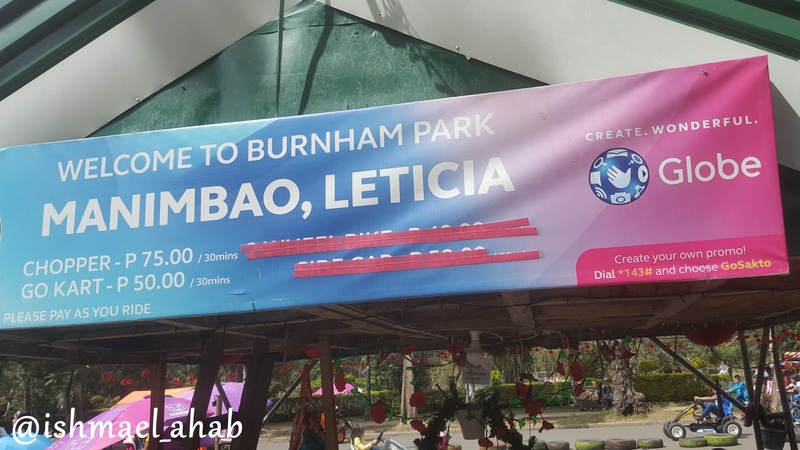 That park is none other than Burnham Park. Elephant statue in Children's Playground in Burnham Park. Burnham Park is located at the center of Baguio City. Thus, almost all jeepneys passes around this park. The park is centrally located that almost all jeepney routes have a terminal just outside of it. We had no difficulty of riding a jeep from Wharton Condominium and we just paid 13 Pesos each. We reached the park in less than one hour. The good thing about Burnham Park is that it doesn’t have any entrance fee. We entered the park for free! 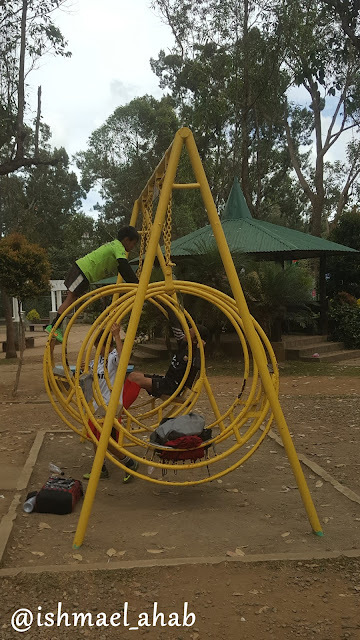 Actually, all public parks in Baguio City can be entered for free. This is one reason why I love about Baguio. Go karting was the first fun thing that we did in Burnham Park. A kart can be rented for 50 Pesos for 30 minutes, while the chopper (I guess this is the four-seater go kart) can be rented for 75 pesos also for 30 minutes. We rented the chopper since we decided to ride as a family. Our kids sat at the front while we pedaled and drive the kart from the back. It was a fun experience at the start but became exhausting near the end of 30-minutes. I guess I need to exercise more to increase my stamina for these kinds of activities. Samuel and Samantha enjoyed riding the kart at first but became bored after a few run around the small course. 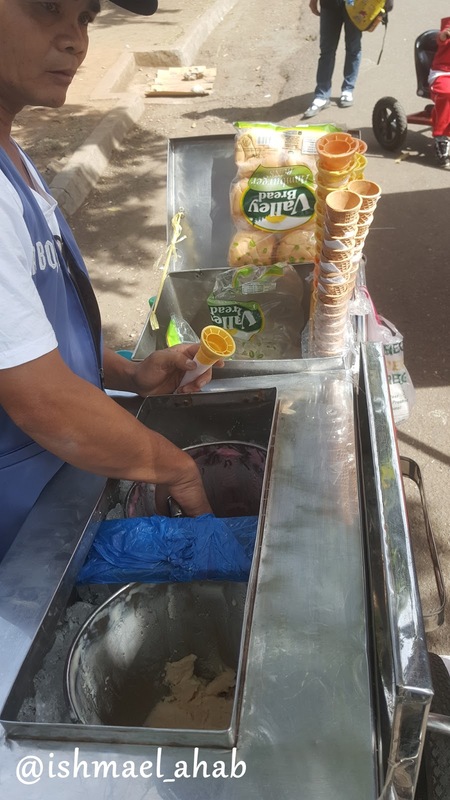 Well, the best way to keep the kids from getting bored is...ice cream! Baguio is famous for strawberries that’s why we bought the strawberry-flavored ice cream. Samuel and Samantha liked it. After 30 minutes of pedaling around the go kart course, we moved on to the fake lake in the middle of the park. This is the iconic Burnham Lake, which is famous for boating. Of course, we didn’t miss the opportunity and rented a boat. We were given the option to row the boat ourselves or get a boatman. I don’t know how to row a boat so we chose the latter option. The actual price of renting a boat is 200 Pesos but my Beloved Wife managed to haggle with the boatman so we rented the boat for 150 Pesos. The boatman toured us around the lake. It was an uneventful tour and we got bored quickly. We disembarked the boat even if our time was not finished. Well, at least we got our selfies in the middle of Burnham Lake. Burnham Lake and Burnham Park was so named not because of burnt hams but because of the American architect Daniel Hudson Burnham. 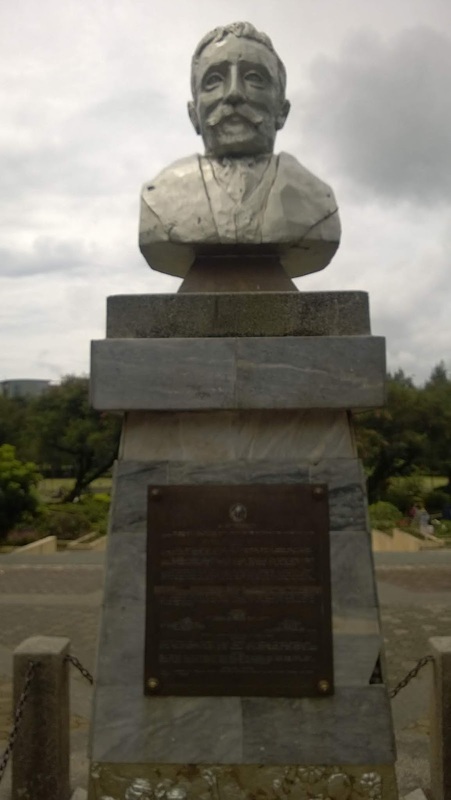 He and William Parsons were commissioned by the US Colonial Government to prepare the plans for Baguio City. Burnham believed that “every citizen should be within walking distance of a park”. This is the reason why Burnham Park is at the center of the city and very accessible to everyone. Our next stop is the Children’s Playground, which is the most fun part of our trip to Burnham Park. This is the first time that Samuel and Samantha saw a true outdoor playground. So, they ran. They climbed up and down. They went down the slide. They didn’t stopped playing to the point that we have to drag them out of Burnham Park at lunch time. I understand my children’s excitement with this playground. The reason is that the town in Laguna where we live didn’t have decent playground. We spent the whole morning in Burnham Park. All in all, it was a fun experience. I enjoyed this park because I saw my children having great fun. The people of Baguio are very fortunate that they got Daniel Burnham to plan their city. Their city became beautiful and surrounded by greens and is worthy to be called as the City of Pines. And I envy them for that. The designs of the boat are nice for selfie and they are cute! Nice park with all the greenery and lake. They are really nice. I wish that have park like this near our house. Now i am really curios who you are in real life! as in no trace!. This post reminds me so much of my good times in Baguio 4 years ago. Hello. I have not been to Burnham for years! Moreso, to ride one of those boats which I have never done, lol! I am glad your family enjoyed your trip and more in the future. Also, it is nice to see your children happy. Thank you Jonathan. Our goal in that trip to Baguio is to make the little ones happy. OY! I miss the ice cream in Pinas. I went to Burnham years ago by night! lol, so i wasnt really able to enjoy the place! Good thing you and your family enjoyed it! You should've brought a date so that you enjoyed Burnham Park that night. Beautiful swans - that is the symbol of my town, Sibu in Sarawak. Wow. Now I know. So does Sibu have a swan lake?